Check our course schedule to determine the courses being offered at Belmont College. Submit an Application for Admission with Transfer- TRN as your Program of Interest. 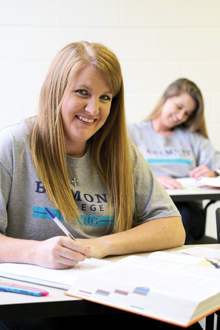 Secure the proper approval from your home institution to take the course at Belmont College. This may include completing a permission form and/or gathering signatures from your Registrar or Academic Advisor. Click on your school below to link to your Transient Permission Form. A copy of your completed form must be turned in to the Belmont College Records Office or faxed to 740.699.3049 before you register. Contact Belmont College at 740.695.8516 to register for your course. Make payment arrangements. Payment information can be obtained by contacting Financial Aid or the Business Office. Kent State University – Contact the University Registrar at 330-672-3131 for more information. Marietta College – Contact the Marietta College Records Office at 740.376.4723 for more information. Youngstown State University- You will need to contact your academic advisor for approval of any courses you plan to take at Belmont College. You must provide your academic advisor with the Belmont College course number and description. Your academic advisor should then provide you with written approval to take the course.